With homify 360°, we make it our mission to bring you daily discoveries of architectural beauties worldwide, whether modern, industrial, Asian, or otherwise. 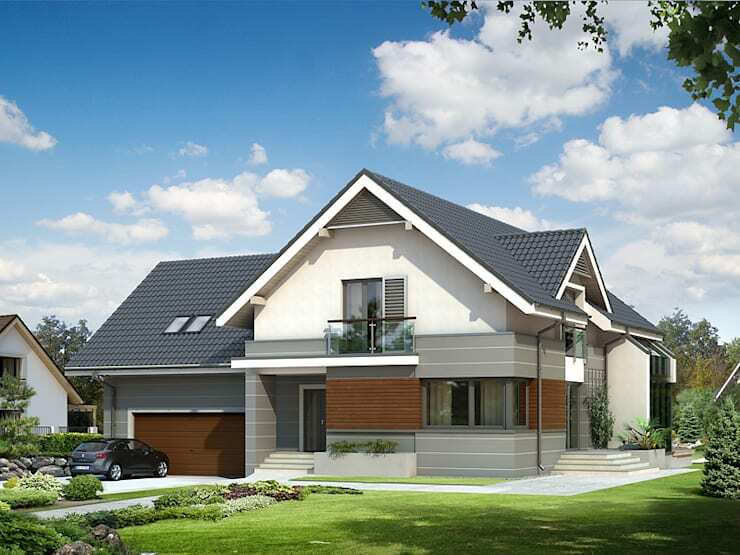 Today’s highlight takes us all the way to Poland, eastern Europe, for a look at a charming little suburban residence that looks neat and modern on the outside, but then boosts the style factor considerably on the inside. 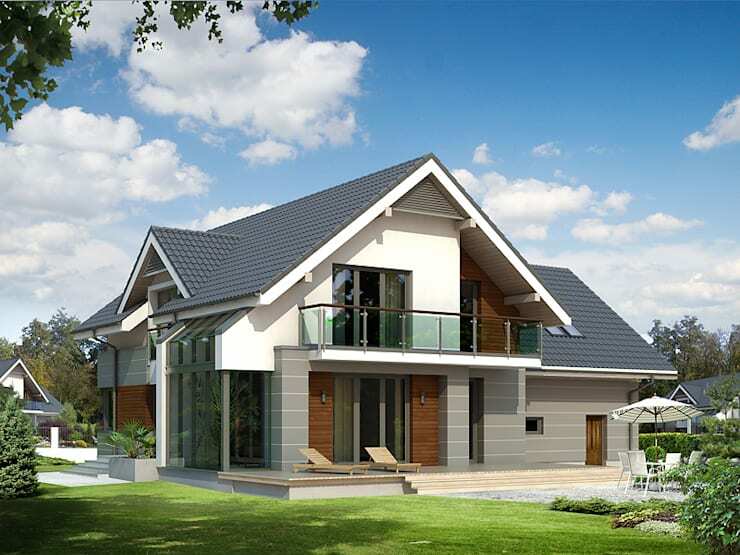 Courtesy of Polish architectural experts Domy, get ready for some stylish dreams in the suburbs. One can almost hear dogs barking and children laughing when viewing this facade – is it not just your typical suburban family home? All the classic elements are here: the pitched roof, the wide windows, the green lawn, the cute car in the driveway… All that’s missing is the white picket fence. That may be, but it does not mean that this setting is bland or boring. Far from it! Typically modern, the house boasts a strong sense of linear design and neutral colours. Creams, beiges, greys and browns all make cameo appearances in one form or another, with the strongest materials being concrete and wood. Time to see what the insides have to offer – and what a beauty. The exterior facade’s modern style continues in the interiors, albeit on a more glamorous level. 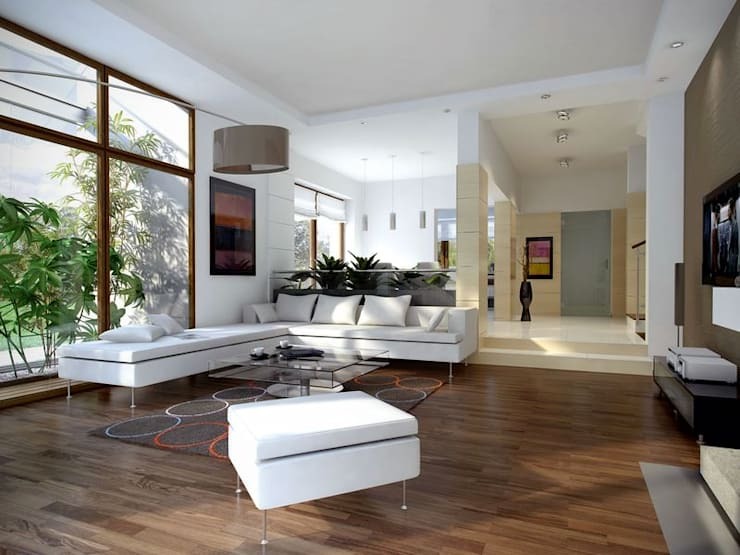 Cocoa-brown wooden floors make for a graceful interior ambience, with friendly natural lighting illuminating select parts considering those giant windows and doors. An L-shape modern couch offers up comfy seating in a soft white colour, strongly mimicking the tone of the walls and ceiling. Notice how subtly the circular pattern of the rug contrasts with the overall linear design of the interiors. A heightened platform, coated in gleaming cream tile, dishes up the dining area. 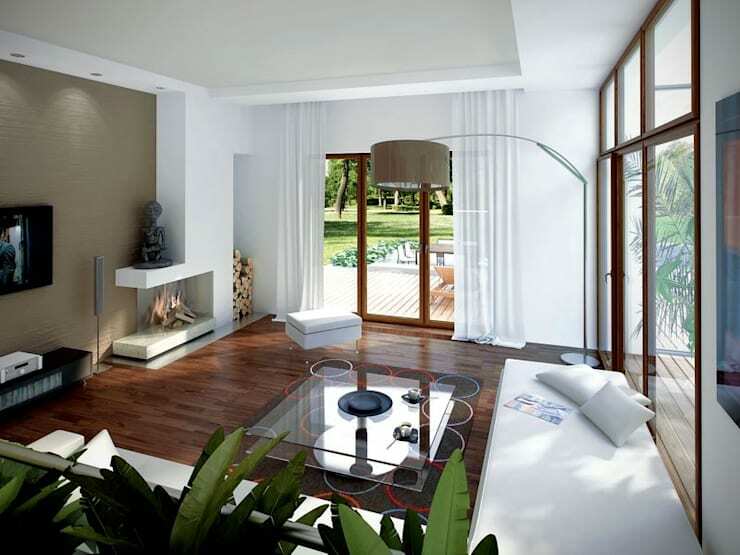 To make the most of the available space, an open-floor plan was designed. Platforms are just one of many ways to separate different rooms without resorting to walls. From this angle, we get a nice, open view of the house, plus the garden outside. 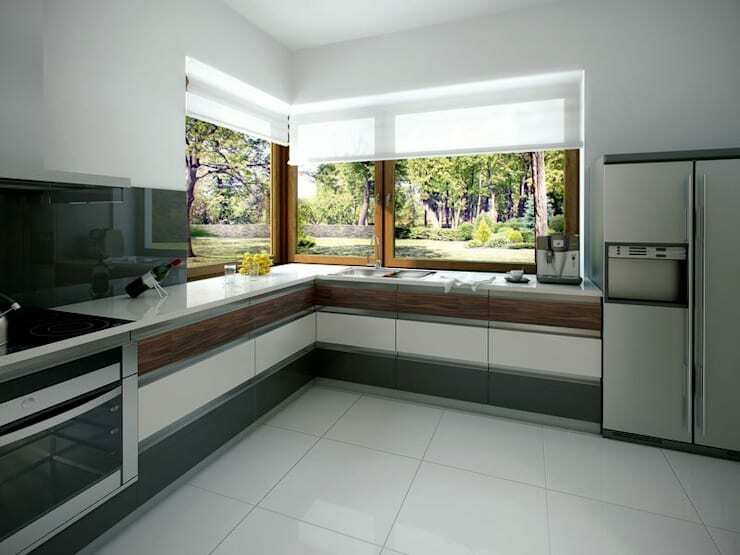 Be sure to take a look at homify’s diverse range of dining rooms in a multitude of different styles and layouts. Viewing the living room from the dining area, we get a clear sense of how the room works. The far corner is used for housing firewood (a most stylish touch that ensures even more neutral colours are added to the interior palette). Right next to it, a modern fireplace crackles with delight. Here we can also see the focal point of the living room – the beige wall, against which the fireplace and TV is placed, ensuring that all eyes are drawn towards it. Glass sliding doors with wooden frames ensure strong links with the exterior landscapes, allowing that green lawn and blue sky to become part of the interior décor. The oversized tiles of the dining area make another appearance in the kitchen, ensuring a touch that is both modern and classic. Small tiles tend to look outdated quite soon, yet large ones can last much longer without causing the style to look tired. Together with the tile, wood and stainless steel up the modern factor considerably. And just look at all that countertop prepping space! In addition to the aforementioned areas, two bathrooms can be found in the house, as well as three comfy-sized bedrooms on the top floor. We couldn’t leave without a glance at the back yard – and we’re fortunate to say that we’re not disappointed. The same open and lush look that was so expertly achieved in the front side continues in the back, only in a more relaxed form. Soft grass only forms part of the tranquil setting; check out those stylish loungers on the wooden deck, as well as the dining set covered by a parasol to the far right. The top floor presents a balcony with stylish glass balustrades, allowing the owners to relax with their morning coffee while admiring the pristine beauty that is their garden. And those wishing to practice their green thumbs have a multitude of plants and flowers at their disposal! Love gardening, but don’t want the whole neighbourhood to see? Let’s see some of: The best garden privacy options. Can you see yourself living in such a modern house? Or is it not really your style? Share your thoughts in our comments section.